Be prepared to see the most critically acclaimed, best-selling rap artist of the last year! 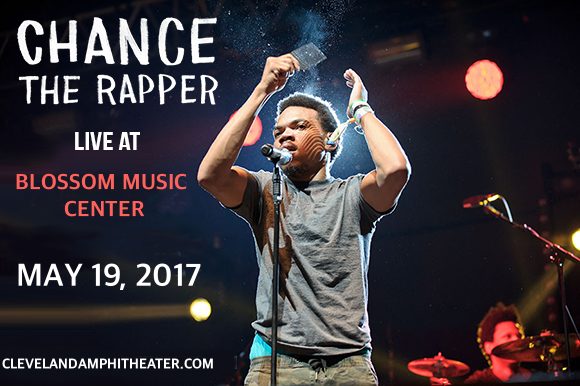 That’s right, CHANCE THE RAPPER will headline the Blossom Music Center on May the 19th! Get ready for a show that will blow you away – and sell out fast!!! Make sure you get your tickets quick – click the “Buy Tickets,” button above and ensure you have yours now. Influenced by jazz and soul, Chance The Rapper (otherwise known as Chancelor Johnathan Bennett) picked up on rap and hip-hop in his first year of high school in middle-class West Chathan, Chicago, forming a duo called Instrumentality with a friend. Ironically, his schoolteachers mocked his ambitions to become a professional rapper, and it was during a 10-day suspension in his senior year that he really got to work, putting together his very first full-length mixtape, entitled “10 Day.” He released the song “Windows,” and promoted the mixtape in 2011, releasing it in 2012. It was a huge local hit, attracting the attention of both the public and media, with Complex magazine calling him one of "10 New Chicago Rappers to Watch Out For”. Today, he has won 3 Grammy awards and achieved the feat of writing the first streaming-only full-length release to win a Grammy and to chart with his incredible 2016 mixtape “Coloring Book,” a huge critical and commercial success. So don’t delay – get your tickets and get ready to experience the mind-blowing phenomenon yourself with Chance’s “Magnificent Coloring” Tour! !